Bad Faith Waste & Intentional Impairment of Security – when a California borrower is liable for harm to the real estate that secures their loan. Part 1, bad faith waste. It is a general rule of California real estate law that the possessor of property, whether as owner (with a loan against the property), or tenant, not to commit waste. Waste is any act, omission, or neglect that materially reduces the market value of the property. When you take out a loan to buy property, the deed of trust requires that you do not commit waste, and provides that waste can be a default under the terms of the loan. An experienced Sacramento and El Dorado real estate attorney will advise that the reason is that the property secures the debt. Theoretically, the lender gave you an amount equal to or less than what the property is worth, and if you cause the property to become worth less than the loan, the lender is at risk. You seldom see this issue come up in real estate loans, but it did in a surprising way in a recent Sacramento decision. In Fait v. New Faze Development, Inc., a Sacramento developer purchased two lots containing a church and other small building in 2005. The plan was to redevelop it into a mixed use property. 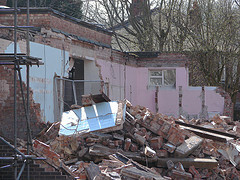 They evicted the tenants and demolished the property in 2006. The economy tanked and the developer defaulted, resulting in a foreclosure sale of the bare land. The lender then sued for bad faith waste and intentional impairment of security- demolishing the building reduced the value of the property, and thus what the lender got on the foreclosure sale. The trial court threw out the bad faith waste claim, finding that there was no evidence of recklessness and intent to despoil the property. But the court of appeals reversed – evidence of recklessness and intent to despoil is not required, based on the 1975 California Supreme Court decision in Cornelison. It looked at the purpose of Civil Procedure section 580b– in the event of a depression of land values, it is to prevent aggravating the downturn that would result if defaulting purchasers lost the land PLUS had personal liability. Allowing an action for waste would frustrate this purpose, because defaulting purchasers would both lose the land and have liability, and the acts giving rise to the liability (the waste) in many cases would be caused by that economic downturn. If you are having trouble paying the mortgage, you have more trouble maintaining the property. If a waste action was then allowed after a trustee’s sale, it would give the lender the equivalent to a deficiency judgment, contrary to the purpose of 580b. When the owner commits waste solely because of the economic pressure of a market depression, the reduction in value is the same as if the loss was directly caused by the general decline in property values. On the other hand, if the conduct is not solely the result of the downturn, than the damages are not of the type of risk that purchase money lenders are required to shoulder. Here, the buildings were demolished before the developer had the money to complete development or pay off the note. This was an overanxious developer in a hot market, and the lender has a claim for waste. With 20-20 hindsight, it appears that the borrower needs to have financing in place as well as other necessary commitments (building permits; zoning changes) to be safe before demolishing buildings or otherwise reducing the value of the property. Part 2 will discuss intentional impairment of security.